Day three in Zurich and with the first show on the horizon we were up early and ready for a big day. The girls were disappointed that they couldn’t see the Alps from anywhere we were so they took off for the Alps at 7 AM in the morning by train. They ended up going to Interlachen and taking the funicular to the top of a mountain. The scenery on the way was spectacular and they said they had never seen water so clear in all the streams along the railroad tracks. They were really happy they got to see the Alps even if it was 70 on the top of the mountain. My day started out with the first roll call at 9 AM. Right after that I hit one of my targets for the trip – a macaroon store called Sprugl. We had been told about it by a flight attendant when we went to LA for Van Halen. She had said they were the best treat in the world and she was right. I sampled one and was planning on buying a large box to bring home for everybody – unfortunately they only are good for 3 days so if you want one you need to go to Zurich. I will tell you it’s definitely worth it! We had another roll call at noon, a two hour break where I had some great Zurich pizza with Jen and Steve from Portland and then back for the last few hours waiting in line. We were told we wouldn’t get in the stadium until about 5 but at 4:30 the line started moving and we were in. They took the first 100 of us into the stadium and let us wait in there while the band finished up the soundcheck. We got to hear a great version of “Take Them as They Come” which I’d get to hear again in London. 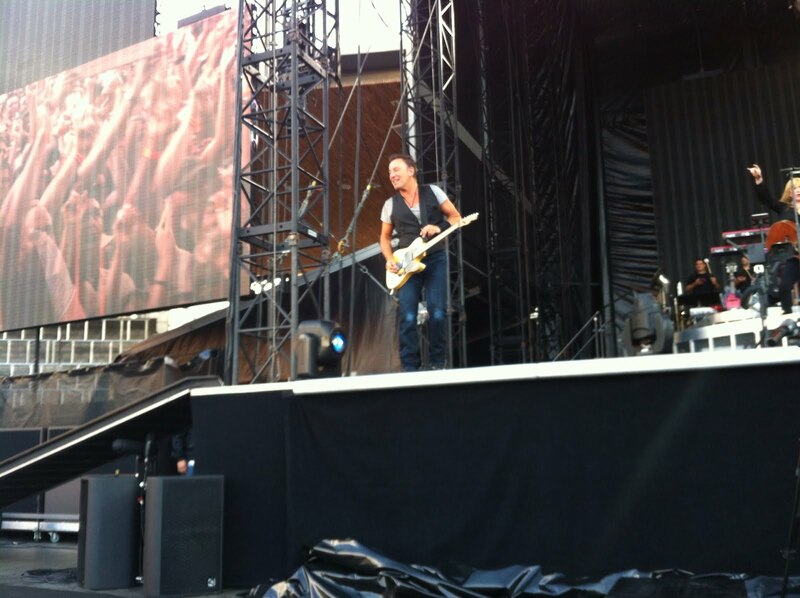 Always interesting that you hear songs at soundcheck but then not at the show that night – part of the mystery of Bruce! Once the soundcheck was completed we headed down to the field and the mad rush for everybody to grab their spot. Most of my new friends went for what I call the “touching spots” where they can grab and touch Bruce. Not really interested in touching a 62 year old man so I stuck to my plan – stage right in front of Nils and Soozie. Got my spot in the front row only a few feet from the stage and settled in for the wait. I got to meet lots of new friends that I would be spending the next 5 hours with. Marcel was to my right and he had been about 5 in front of me in line – a 27 year old from Germany who had drove down to Zurich by himself for the show. Topi was from Norway and he was by himself – said he wanted to see a show before Bruce came to Norway later in the summer. Two great young guys who knew every single song that was played all night long, still amazing to me that they can do this in another language! The show began about 8 PM and started off with a rarity – Don’t Look Back! It’s one of those songs I know but barely. If I had been in charge of tweeting the setlist it would have been trouble (save that for the Vienna and London shows). The entire crowd from my spot was really into the show singing and jumping to every song. I didn’t realize that the rest of the stadium was pretty mellow – I would later hear that from Jo and Kar that their section spent most of the show in their seats. Come on people, it’s rock and roll!!!! Highlights of the main set were Growin’ Up, solo piano by request If I should Fall Behind, Save My Love and my current favorite Bruce song The River. Of course we got Waiting on a Sunny Day which is #1 on my despised song list but I have to admit that even though it’s irritating the crowd really does like it. Shockingly we got Workin’ on a Dream as a request! 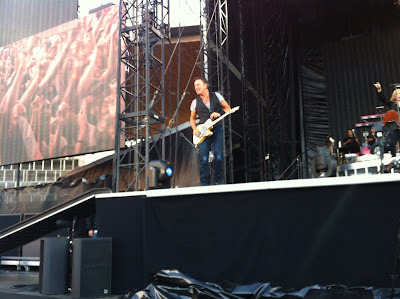 There was an audible groan from the pit when Bruce showed it to us. Seriously, didn’t we all hear that enough last tour? The only good news was at least we didn’t get the good wood and the bad wood rap but we still wasted that request spot. After a two hour main set when nearly every other band in the world is off in the dressing room the main event starts. The European shows have almost all started with Born in the USA and Zurich was no different. The whole stadium was now on its feet and as best I could tell stayed that way for the next hour! That was followed by Born to Run, 7 Nights to Rock, Dancing in the Dark where Becca from Baltimore got to dance with Bruce, 10th Avenue with the great Clarence tribute and then Twist and Shout to close out the night. Amazing how fast 3 hours and 20 minutes can go when you barely have time to catch your breath. After the band left the stage I told my new young friends that I expected them to be doing the same thing when they are 52 – they just laughed and said they hoped they can! Now to try and figure out how to get on the train along with 50,000 others at the same time. Fortunately there were many trams waiting for us but there was some confusion as to where they went and with my great comprehension of German I got on the first train I could. I ended up at some other train station but with the help of a policeman and some blind luck I found where to catch the #11 tram. As luck might have it Jo and Kar got on the right tram, changed in the city center and ended up sitting on the tram I boarded downtown. I had ducked into a McDonalds and grabbed a Coke and some fries since I had nothing to eat since lunch – can’t beat McD’s for 10 bucks for fries and a drink. Switzerland is pretty damned expensive but I didn’t care of that point. Just about then a thunderstorm hit but we were inside the tram car and got back to the Renaissance right about midnight. A long day but really rewarding and city one of our three city adventure was in the books. Tuesday AM it’s off to Vienna on some airline called AirBerlin – we shall see how that goes! Tour premieres in Zurich were Don’t Look Back, Working on a Dream and If I Should Fall Behind. First time sings for me were Don’t Look Back, Growin’ Up, Save My Love and Twist and Shout. Final count – 31 songs in total for the show. How good is the Wienerschnitzel in Vienna?